This section features PowerPoint animations, PowerPoint games, artworks, anime and movies created by PowerPoint Heaven Contributors. 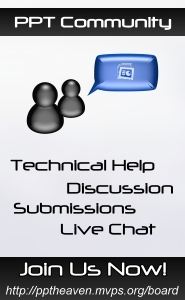 Note that the PowerPoint animations or presentations found here do not include tutorials. If you are looking for PowerPoint tutorials, check out the Tutorials section. Requirements: The samples on this site make use of advanced PowerPoint animations that are introduced in PowerPoint 2002/XP and above. If you do not have PowerPoint 2002/XP and later versions, you will need to download the free PowerPoint Viewer 2003 as the minimum requirement for viewing. Note: The animations found in these presentations or showcases are done entirely using PowerPoint. NO animated gifs, video or flash are used. This section features showcases done with the use of advanced PowerPoint animations which can be useful when implemented into presentations and games. Submitted by Coolguy7. This showcase is a winning entry for the Intro Animation Contest. Intro Animation Contest is a celebration contest held by Korea's PowerPoint Expert Club. Submitted by pso2850. An inspiring piece of artwork done using PowerPoint AutoShapes and well synchronized with the beat of the music. Submitted by KDC (kdc1130). This is a showcase featuring advanced text animations mirroring an excerpt of Ellegarden's (a Japanese rock band) motion video, Marry Me. Submitted by Bugycraxone. This is a showcase featuring advanced text animations making use of the lyrics in Ellegarden's Marry Me. Submitted by oma1094. Omegaoma's Motion is a state of art showcase done in PowerPoint. It demonstrates how sophisticated animations can be achieved and presently elegantly in PowerPoint. Submitted by anubis0129. Watch the head of Optimus Prime from Transformers drawn and animated in 3D. Submitted by oma1094. An introduction showcase that features film-like screening animation. Submitted by TypetyTypeType. Inspired by the iPhone commercial, this is a parody of the commercial showing you the iPhone with PowerPoint application installed. Submitted by rapidppt. A presentation showcase of Bejing Olympic Games titled One World One Dream. Submitted by rapidppt. A short Christmas animation greetings. Submitted by rapidppt. Advertorial showcase of services provided by RapidPPT. Submitted by diyufeixuan. A demonstration of skating motion done in PowerPoint. Shawn Toh (tohlz) is the founder and webmaster of PowerPoint Heaven. He is a Microsoft MVP for PowerPoint (Most Valuable Professional) and a certified Microsoft Office Specialist. He is a presentation consultant and has worked with various companies such as Hwelett Packard and eBay on project consultations and has conducted several PowerPoint workshops for the education sectors. Sandra Johnson is a 20-year marketing communications veteran who has developed and successfully implemented marketing communications programs for clients like 3M Health Care, Pfizer Pharmaceuticals and Porsche Cars of North America. Her strategic expertise and creative PowerPoint design and consultation skills have made her a valuable resource for her clients since forming her PowerPoint presentation business in 2001. Anime is a Japanese style of motion-picture animation, characterized by highly stylized, colorful art, futuristic themes and robot-like characters. PowerPoint Anime shows you how anime can be drawn and animated using PowerPoint. Han Byul Jang started using PowerPoint when he was only 9 years old. Han Byul Jang is a rising star, PowerPoint artist and animator in Korea's PowerPoint Expert Club (An online PowerPoint Community). Also known as Zzangdol in the community, he can draw realistic anime characters (completely using PowerPoint's Freeform tool) and animate them all in PowerPoint. Zzangdol's PowerPoint artworks are now hosted by PowerPoint Heaven so that you can see how Anime characters are drawn and animated in PowerPoint and take PowerPoint's Freeform to the expert level! This section features artworks drawn in PowerPoint. See how one can draw PowerPoint Arts and realistic drawings in PowerPoint! Submitted by Alex F. An artwork that depicts the protagonist and villains in Super Paper Mario. Submitted by Timothy Ansell. This artwork shows you a landscape scenery from two different viewpoints. Submitted by Boo Jia Hao. Drawing of Ulquiorra Schiffer, a fictional character in the anime and manga series, Bleach. Submitted by Dhany Rodríguez (firedolphin). Drawing of a green eyes geisha. Submitted by Dhany Rodríguez (firedolphin). Drawing of his best friend, Ely. Submitted by James Niedfeldt. An artwork showing characters from Lucky Star manga. Submitted by Boo Jia Hao. Drawing of Kuchiki Byakuya, a fictional character in the anime and manga series, Bleach. Submitted by Timothy Ansell. This artwork features 3 beautiful sceneries of Sunrise, Sunset fishing and Ruins concept art. Submitted by Trevor Odelberg (Vector Studios). A birthday gift artwork featuring characters from Kingdom Hearts. Submitted by Trevor Odelberg (Vector Studios). A dark, twisted and chilling piece of artwork. Submitted by Emprovision. Collection of artwork featuring the F-22 Raptor stealth fighter, the B-2 Spirit stealth bomber, the F-117 Nighthawk attack aircraft, and the SU-27 Flanker. Submitted by Arnoldo Gómez. A drawing of Robot GSA-01. Submitted by Adam Terrelonge. A drawing consisting of 4 anime girls. Jeremiah Lee (Jerry), began using PowerPoint because of his interest in arts and animations. He specializes in drawing comic and human characters using PowerPoint. He takes every character he draws into deep details by adding cel shading, facial expressions and life to these drawings. Jerry's PowerPoint Artworks are now hosted by PowerPoint Heaven so that you can see how comic characters and human faces can be drawn in PowerPoint! Lee Cherry (Yholl), began using PowerPoint since Year 2003. He is a big fan of the Japanese manga, Dragon Ball, and is the creator of The Howard Chronicles (A parody of Dragon Ball Z). He specializes in drawing manga characters using PowerPoint and most of his works revolve around Dragon Ball. Yholl's PowerPoint Artworks are now hosted by PowerPoint Heaven so that you can see how Dragon Ball characters are drawn in PowerPoint! Gary Andrew A. Lacanilao (Radz) specializes in drawing human characters using PowerPoint. He has also been designing logos in PowerPoint 2007, making use of its new graphics engine, shape effects and advanced features. Colin Neal is a full time lecturer for Hull College teaching Game Design, Digital Graphics, Web Design, Computer Animation and other areas in IT. His teaching area involves a lot of graphic works. Colin specializes in digital arts and realistic human portraits using PowerPoint and Paint Shop Pro. This section features games that are created using PowerPoint. They do not lose out (or even better) to Flash games found on the internet! Having fun trying them out. Submitted by KDC (kdc1130). Music ver. C is a PowerPoint music rhythm game. The objective is to test the player's ability to follow a musical beat and stay with the rhythm of Pachelbel's Canon. Submitted by Typety Type Type. Doodle Jumper is a mini game where you play as an animated stick figure on a bulletin board, trying to jump across a paper to avoid the falling thumbtacks. Submitted by Trevor S. On a quiet summer night, a gunshot rings down 2nd Street, and Mr. James P. Woodrow is found dead! Is it the jealous neighbor, the drunk passerby, or the maid gone mad? Its up to you detective, to find the culprit! The Mystery Files is an intriguing PowerPoint adventure game accompanied by several mini puzzles. Submitted by Trevor Odelberg (Vector Studios). A PowerPoint shooting game featuring robust score system done using VBA, complete with ammo and multipliers. Each target gives you a determined amount of points and effects, adding to your highscore and total hit rate. Run out of ammo and you lose! Submitted by Zaoeyo. Music's Edge is a sandbox-based music rhythm game. Follow the musical beat and move your cursor to touch the squares to create a rhythm. Submitted by Zaoeyo. Music Master is a sandbox-based music rhythm game that includes 4 kinds of musical instruments - Percussion, Piano, Strings and Harmonica, each with different style of playing. Mohammad Ahmed Fikree is a creator for a series of PowerPoint Games. His Fikree's Projects include PowerPoint Games such as mouse maze, with awesome high quality music, and graphics done using Adobe Photoshop, adding more depths to the entire game. Fikree's PowerPoint Games are now hosted by PowerPoint Heaven so that you can enjoy these games and also get a chance to learn more about creating games with PowerPoint. Anthony Barfield is a PowerPoint Games creator. Anthony has a high standard for quality and gameplay aspects. He has created many quality works which include his Pixels series. He is also the first PowerPoint Heaven contributor to utilize PowerPoint 2007 on his recent works. Anthony's PowerPoint Games are now hosted by PowerPoint Heaven so that you can enjoy these games and also get a chance to learn more about creating games with PowerPoint. Ted Thayer is a specialist in creating PowerPoint Games. He is also proficient in drawing artworks with PowerPoint. In year 2007, Ted participated in iFilm's PowerPoint 2007 Contest - Your Best Moment in PowerPoint 2007. He was selected as one of the finalists by the internal judges, which then won him the 2nd place with over 40,000 online votes. PowerPoint Movies are animated shows or cartoons that contains complex PowerPoint animations. This section will show you movies similar to those done using Macromedia Flash. See what PowerPoint can do with animations under this section. 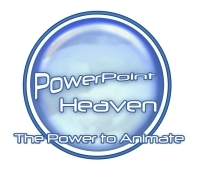 PowerPoint Heaven is the first and only site that produces real animated cartoons and movies using PowerPoint. Be amazed! Submitted by castleofgod. Animation Vs Newbie is a PowerPoint Movie inspired by Animator vs. Animation, with a stick figure interacting on PowerPoint 2007 interface with the animations done entirely in PowerPoint. This submission is the winning entry for Korea's PowerPoint Expert Club Intro Animation Contest 3. Blastoons specializes in creating PowerPoint Movies. He uses Microsoft PowerPoint as the sole animation software package. Works are realized using animations, drawings, and 3D shape tools in PowerPoint and exporting the resulting presentations to video with ACA Capture Studio and CamStudio. Evolution Warriors is a PowerPoint Movie inspired by Shadow Fighter. This movie contains 1,500+ custom animations and all graphics are done entirely with PowerPoint's AutoShapes.